Nearly 80 percent of people believe the Internet should be a human right. The Internet of Things brings with it an explosion of data, along with security and privacy concerns, but there are still many reasons to love the Internet. 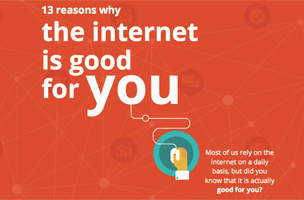 The folks over at NeoMam Studios put together an interactive infographic of 13 reasons why the Internet is good for you. For instance, the Internet helps people take control of their health: teens use it to research and discuss topics that are difficult for them to talk about, senior citizens on the Web are less depressed and more mentally active, and social media helps people make more informed health decisions. It also increases graduation rates, contributes to the GDP in many countries and creates jobs (for every one job created in tech, five more are created in other sectors). Crowdfunded campaigns raise millions of dollars via the Internet. Thanks to the Internet, we can communicate with others over vast distances. Divorce and separation rates are lower for couples who met online. Check out some of the reasons below, and click here for the interactive version.